As we wonder what Horace Greeley was on about, we might recall that it was on this date in 1601 that agents of Robert Devereux, 2nd Earl of Essex, paid Shakespeare’s theater troupe, The Lord Chamberlin’s Men, to perform Richard II. The group had been reluctant to dust off the by-then old piece of repertoire, but were convinced by a 40 shilling “gratuity.” Essex’s purpose in the endeavor was to stir the public against Queen Elizabeth (who identified– and was identified with– the childless, and thus heir-less Richard II, who is deposed in the play). Essex had squandered and blundered his way into financial trouble and out of the Queen’s graces; desperate, he had plotted a rebellion that he launched two days after the play’s performance– only to find that he had garnered no support at all from the people. 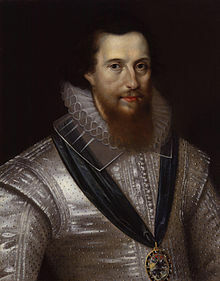 He was quickly captured by Elizabeth’s Lord High Admiral (the Earl of Nottingham) and his men, tried, convicted, and on February 25th, less than two weeks after his patronage of the stage, beheaded at the Tower of London.